We kicked up a sourdough starter a couple of years ago and have managed to keep it alive through some skill and a bit of reliance on the biology of bacterial and yeast cultures. It took some CPR after this year’s summer vacation to bring it back from the brink of death, but we pulled it off and now it’s as vital as ever. Lots of people want to make sourdough bread, but run into two basic problems. One, initiating a starter can be hit or mess. A new starter always goes through a ‘stinky’ phase, where the flour/water mush smells like vomit, a landfill, or even worse. If you’re lucky, it turns the corner (aka your bacterial culture wipes out the bad stuff). If not, you start over. Much easier is to get a bit of a friend’s starter, which is a service I’ve now provided many, many times, with mixed results. This leads to the second problem: once you have a bit of starter, what do you do to keep it happy and actually make bread? There are myriad cookbooks and Web pages out there with all kinds of advice, but to my mind, many of them overcomplicate the process and sort of ignore the basic and elegant biology of a viable sourdough starter. Rather than pass on my hard-won wisdom piecemeal, I thought I’d take a few moments to record the process. A prefatory note: this process should be fun. Much like homebrewing, the mantra of which is Papazian’s “relax, don’t worry, have a homebrew,” breadbaking is about making bread. The stakes here are low. After all, the main ingredients are flour, water, and salt, not exactly truffles and saffron on the financial scale. If you botch some bread, feed it to the ducks, use it as a doorstop, etc. If your starter dies, do not weep. Just chuck it and start again. Flakes – Do this within a week of getting them from me. They supposedly have a fairly long shelf life, but why wait? Dump the flakes in a medium-sized glass, ceramic, porcelain, or stoneware bowl. Plastic is fine, too, but not optimal. Put in about a tablespoon of flour–rye, AP, or whole wheat are all fine, preferably organic–and then enough water to make the flour and flakes into a paste about the consistency of oatmeal. Cover the bowl with a cloth and leave it on the counter. Within a day or day and a half (ambient temperature and humidity matter), it should begin bubbling a bit. If not, wait another day. Once it bubbles, feed it daily, doubling its bulk, more or less, with each feeding. Once you’ve got a couple of cups worth of starter, you’re in business. Starter – Do this within a day or two of getting it from me, and until you can do this keep the baggie in the fridge. Scrape the goo out of the bag with a spoon into a bowl as described above and feed it a few tablespoons of flour and enough water to maintain about the same consistency. It should start bubbling within 6-8 hours at most, depending on conditions. Simply feed daily as above, bulking it up. When you have a starter on the counter for days on end like this, it’s normal for it to form a dry skin on top between feedings. Just stir it in during the next feeding. Feed every day, or at least every other day, and the skin will not be a problem. I suppose one could avoid this by using a plastic lid or plastic wrap instead of a cloth, but I like the cloth since it breathes and lets a bit of the starter aroma into the air. It’s a pleasant sour smell. Once you’ve got enough starter with which to bake (about 300 g for a kilo loaf, or about half a cup), leaving about a couple of cups to continue the starter, you’re ready to bake. There are myriad recipes out there, but I can describe here my go-to loaf and then you can riff on that process with just about recipe. The loaf I make takes 1000g of ingredients: 300g of starter, 300g AP flour, 100g WW flour, 300g water, some salt, and sometimes flaxseed, sunflower seeds, etc. 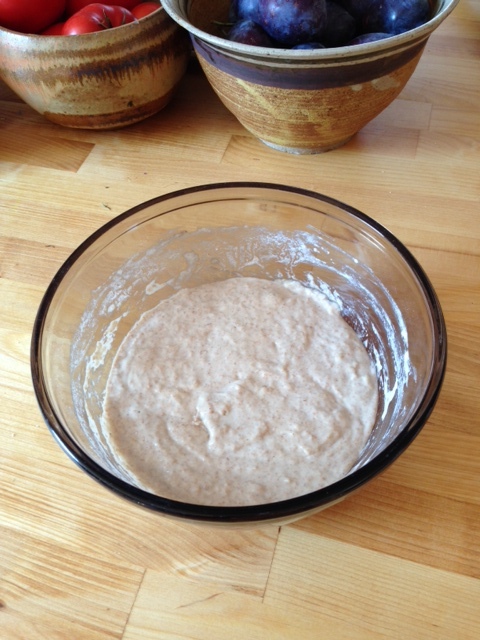 If your starter is warm and active–i.e.-it’s been sitting on the counter bubbling away–you’re ready to use it. Make your dough, let it rise (sourdough is slower than yeast, but oh so superior in every way), and bake as you would pretty much any yeast bread. I strongly recommend getting a kitchen scale to do this by weight rather than measurements. Starter is stickier than most known substances, so the thought of having to measure it in a cup fills me with dread. Besides, if you put a stainless steel baking bowl on a scale and zero it, you can weight out the ingredients in about a minute, no muss, no fuss. So know you’ve got bread rising and are about to enjoy the fruits of your labour. What to do with the rest of the bowl of starter? I put mine in an airtight plastic container, feed it a wee bit (maybe a teaspoon and enough water to keep the consistency), and then put it in the fridge. I know from experience this will last in the fridge in this state for at least three weeks. Beyond that, you can ostensibly freeze it, although to be honest that hasn’t worked well for me in the past. 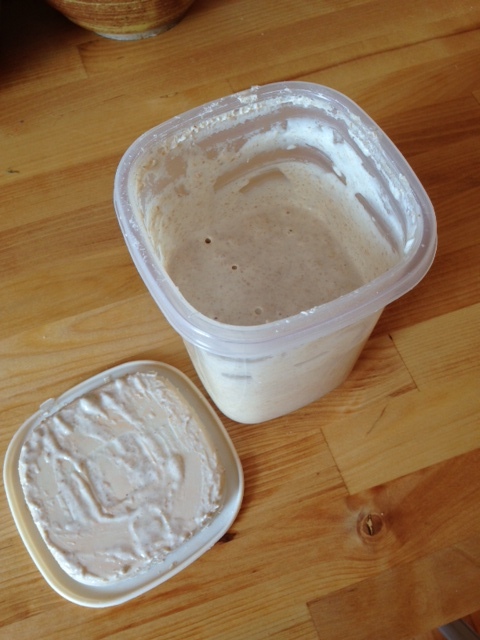 Sometimes if the starter is overly excited–who knows, maybe the yeast are having a party–it will pop the lid, but this is rare, and if you use a large enough container, not a big deal. Next time you want to bake, take this out of the fridge, scoop out enough to make a sufficient ‘production’ starter batch. For the example above, this is would be at least 300g, so I’ll put about 150-200g or so (I eyeball this, really) in a glass or ceramic bowl, feed it with flour and water until there’s about 400g in the bowl. 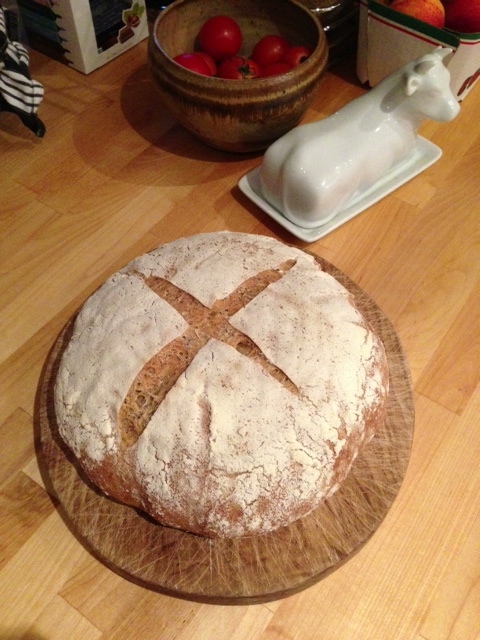 It sits for 6-8 hours (sometimes more, sometimes less) on the counter until it is bubbly and airy, then I bake. Overnight is fine, too. Measure out what you need, and put the remainder back with the “mother” culture in the fridge, stirring this ‘new’ starter in well to mix it up. I typically toss in some flour when doing this to feed the whole mass. I’ve probably left out all sorts of details, so if anyone has questions, please ask them below and I’ll improve these instructions accordingly. Torture Chamber, originally uploaded by jda127. Does this look like a torture device to you? Given your grown-up size, it may indeed be too small for your needs, but realize that the intended resident of this cozy little den is 22 pounds soaking wet. She fits. She even curls up into a sweet little cinnamon-coloured ball on her green mattress and snoozes quite nicely of an evening. She knows she fits. She even likes her little den at night. –odor, or, more frankly: stench. 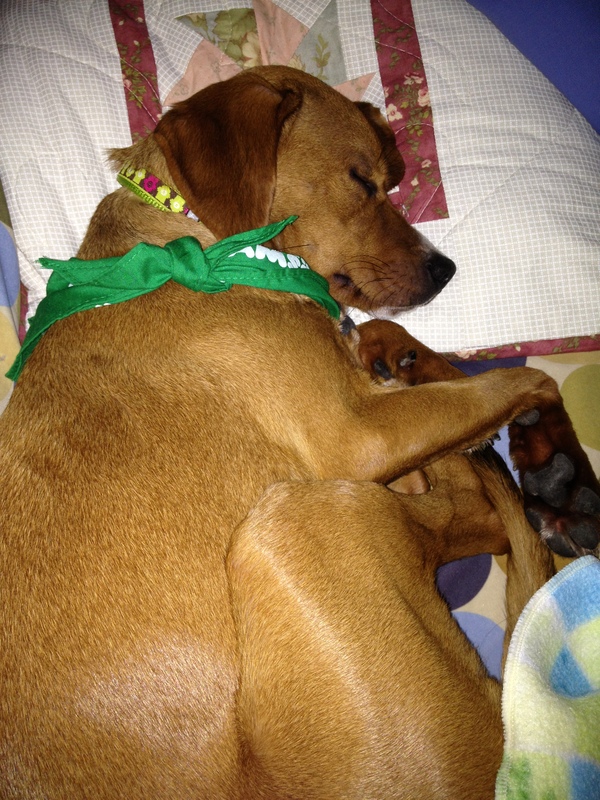 It’s what I like to call “the stink of panic and poop,” since that is what she does in the kennel when we’re not home. She panics, then she poops. –drool, sometimes foamy. Granted, this is not in the kennel but in a wee puddle on the floor in front of the gate to the kennel. Evidence of her slobbering panic attack. Whether the drool happens before, during, or after the poop, who is to say? 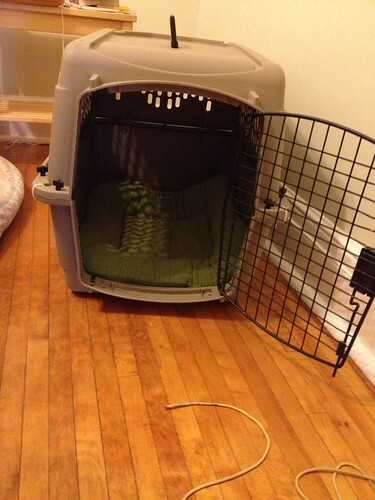 The wire kennel we tried at first was an unmitigated disaster. She busted out of it two or three times (even with gate reinforcements). Ditto the Exercise pen. Those contraptions, being metal, posed a pretty big threat to her continued health, so we opted (on advice of doggie behaviourist) to put her in this plastic contraption. On the plus side, she can’t bust out of it, so she can’t potentially impale herself in the attempt. Her wounds are just wee scrapes on her soft nose (poor doogie) and she isn’t really hurting herself. Also, her panic is contained and she isn’t tearing things up and pooping all over the house. Cleaning out the kennel beats cleaning carpets (or beds, or sofas) every day! But dear sweet Bella: get a grip on yourself!! We always come home! You get to go on runs! You get training time (good doggie, yess, a treat for you! nice sit, nice stay! yesssss goooood doogggiiieeee) and tons of positive reinforcement. You get oodles and oodles of snuggles on the couch and scritches behind the ears. You can do this. You can handle being on your own for six hours. I just know you can. Please! Is that a treat in your pocket?
. . . or are you just happy to see me? We adopted her from the Brantford SPCA not quite two weeks ago and our days are now filled with Very Important Puppy Business. does she need to go outside to pee? is she really THIS hungry? what will a doggie do with a kernel of frozen corn, fallen to the kitchen floor? can a 20lb doggie, upon sensing and rousting a bunny from its bushy lair, actually rip my shoulder out of its socket when it lunges in pursuit? These, my friends, are important questions to ponder. Do not let the snuggly togetherness of Ingrid and Bella in this photo fool you. 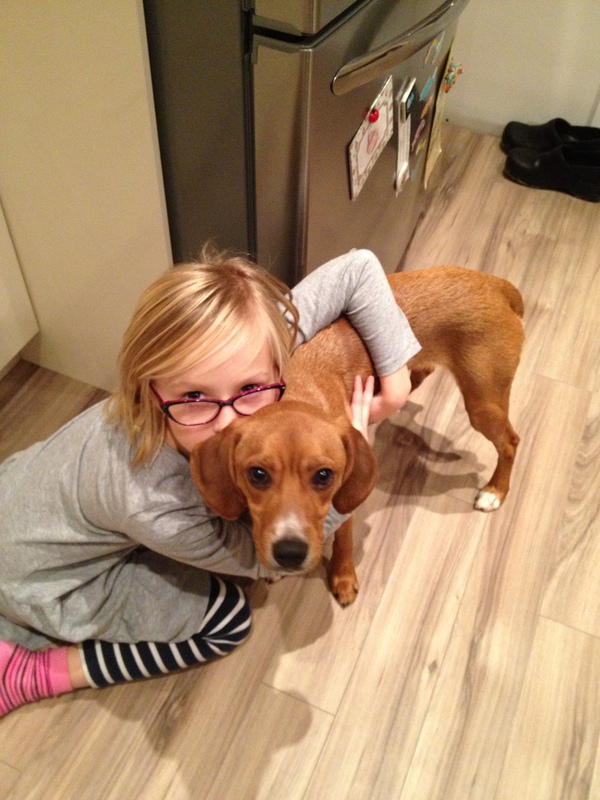 Although we promised the girls a dog as a Christmas present this year, the real and true impetus for adopting a canine companion was mememememe. My motivations were base and shallow indeed: I wanted to be greeted by someone who loved me best and unconditionally every day when I come home from work. Bella fulfils her role as Adorer-of-Jennifer quite nicely, I must say. Some days she is so overjoyed at the presence of her human, that she veritably knocks me off my feet with love and kisses. I, of course, am a total sucker for the wee little snoot and the cute little whiskers and the super soft ears. Left to my own devices, the dog and I would hang out in bed together, reading books and eating cheese on crackers. But I have been given to understand that my anthropomorphizing tendencies do justice neither to Bella the Doggie nor to my family of humans. Alas. So, in the interest of training the doggums in good canine manners, I shall also subject myself to some training. We start Grade 1 doggie obedience in a couple of weeks. She, obviously, will do quite well. She’s smart and will do anything–except lie down–for a treat 🙂 I, on the other hand have a more complex assemblage of internal and external motivators. We shall see if the trainers can find the biscuit of my dreams and train me to train my dog. Otherwise, it’s cheese and crackers for us, Bella! Have you ever had a crappy landlord? Like the one I had for a year with Kim in New Orleans, the one who stuck broken matchsticks inside our window sash to “repair” some rattling going on? Or the one I had another year at university who told us we would have to wait until he got back from vacation to deal with a vermin infestation in our bathroom? I thought those landlords resided safely in my student-ghetto past, in buildings with 40 layers of paint and questionable laundry facilities. Alas, I was mistaken. When you are a grown up and paying grown up rent, you can have crappy landlords who are crappy on a bigger, grown up level. In related news: we are homeowners again and the moving truck comes next week. Eeeeep. Now, this will be our third complete move of house since May 2011 (you envy me, I know) and you would think that such frequent moves would have honed and tempered our packing and sorting skills until I could pack a box of books or kitchen gadgets merely with my steely gaze. Alas, such is not my reality. Reality was a weekend “motivating” the children to pack up their rooms and to do a thorough sorting of STUFF as they went. My slightly guilty feelings, related to the drill sergeant demeanour I was sporting paled in comparison to the piles of paper, unused toys, outgrown shoes and clothing, and random hair accessories discovered in the bins, boxes, nooks and crannies of their rooms. We are buying a house!! Yay and yipppieee. When we moved to The Great White North (TM), we planned on being happy renters for a long, long time. Finished with home repairs! Finished with worrying about the real estate market! Finished with mowing the lawn (lordy how I hate mowing the lawn!)!! Alas, renting, it is not always so simple. Our first landlords were peaches, really. My ideal landlords. Unfortunately, the only place we could rent for them was a 950 ft2 apartment with no yard at all and coin-op laundry in the basement. There are four of us, so that was not a long-term solution. Our current landlords are . . . . well, driving us into home ownership. If I have to deal with renovation crap and annoyance, I at least want it to be my own nest egg I’m feathering and not someone else’s. It didn’t take too long for us to find the house that checked all the boxes for us–right price, right neighborhood, right size. It is currently a duplex but we’re going to convert it back to a single-family home by knocking out a couple of walls and removing an extra kitchen and such. Since there will be sledgehammers, and since the quality of the kitchen and bath reflect the realities of rental properties, we are also renovating a few key spaces and adding AC when we upgrade the furnace, etc. Although we’ve bought and sold three houses in the last decade, this is the first house we’ve (a) had time aplenty to select and (b) had the funds to renovate according to our needs and wishes. So I’m thrilled. In my delusional moments, I picture Dale and me invovled in a great reno project, one that will turn this house into THE HOUSE OF OUR DREAMS!!!! See: don’t they look happy to be working together to build a warm and inviting space for their family? Can’t you just picture that living room as the locus of fabulous parties and cherished memories? Even though I don’t watch HGTV or other home improvement shows, I, too, fall prey to the notion that my house should (a) feel like a sanctuary, (b) reveal something elemental about not only my style but my personality and values, (c) because of (a) and (b) be somehow effortless to create and inhabit. My experience with home renovations has been pretty limited in the last ten years. Other than a bunch of work Dale did on our first house while I was hugely pregnant, we have (he has) just tinkered with a few things. But I do know what it is like to have a home project overwhelm you with its demands. 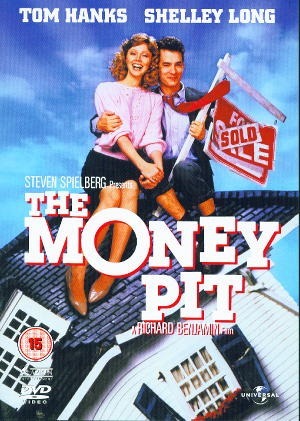 When my mom and I saw Money Pit when it came out, we laughed only to keep from crying. This was the house of my teenage years. Totally overwhelming, especially to me. Since it was not my dream, but my mother’s dream, and since I didn’t understand why I had to work on it (tearing down walls, roofing, plumbing, wood stripping, wallpaper, and the list goes on and on and on) instead of hanging out at the pool, I resented it as this horrible THING that dominated our lives. As anyone who has lived with me or talked houses with me will attest: the experience with my teenage home scarred me for life! I make all sors of proclamations about what I will and will not do in a home (NO STRIPPING WOODWORK, EVER!) and instinctively shy away from tasks that I associate with the “forced labor” of my 13-year-old summer (see above: mowing lawns). That house, the money pit, was never going to live up to its hype for me. There was bad mojo in that house that had nothing to do with my resentment over stripping the finish off wood radiator covers. I was glad when my mom finally sold it. But now I have a house of my own that I need to renovate to make home-y. I worry about the process far more than I worry about the outcome. Dale and I have good taste and I’m sure, when presented with choices, we’ll choose features and fixtures that are fun and fit the space and are good to work with. The house is in good shape, years of renting haven’t trashed it, so it isn’t a depressing scene to ponder even right now. But I worry. I worry about expecting the house to be something it can’t be–becuase I silently expect owning a house in Hamilton to mean that I’m happy and settled and at home here. I want to get attached to this house and have it feel like MINE in a way that none of the other houses we’ve owned ever approached. Poor house, there is a lot resting on your eaves even before the deed is signed. I’m going to try and keep my emotional expectations in check and push my willingness to work (mentally and physically) into the foreground. This should be fun and exciting and NOT a money pit or a hornet’s nest of bad mojo and icky feelings. Oh: and now we need a dog! !